Cowley College Humanities instructor Julie Kratt served on a four-member advisory board for the first-edition text. In the book’s Acknowledgments section, Walter specifically extends her appreciation to Cowley students “for enthusiastically contributing photos and writing.” In the print version of the textbook, Cowley student Aspen Sanders is quoted at the beginning of Chapter One. Later in the chapter, Kylee Martinez states her philosophy on the writing strategy called brainstorming. In Chapter Four, online student Amy Thompson shares a sample definition paragraph, and a few pages later, student Connor Stone’s comparison/contrast paragraph is featured. 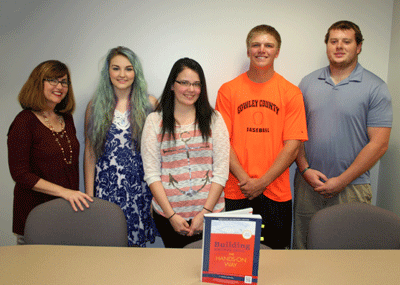 A paragraph by Cowley student Bryce Fischer will be included in an online supplement. Cowley president Dr. Dennis Rittle is excited about Cowley’s role in the new textbook. “We love it when our students have the chance to shine!” Rittle said.